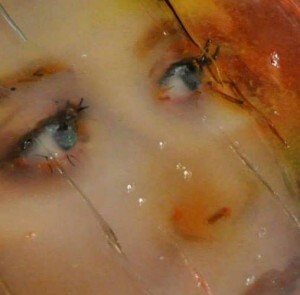 Color in glass differs from color in other mediums, in fact color in glass can transform itself. Glass, unlike other media, has a diversity of ways to show color. With the medium of glass there is reflected light and transmitted light, or both at the same time. When lit from the front, we perceive only the colors of reflected light, similar to most other media, but when glass is lit from the back, we see transmitted light colors, usually however, we can see some of both. To further complicate the use of color in glass, the glass itself can be transparent, translucent, or opaque. The Munsell color system may be useful when selecting glass colors, however there needs to be dual systems: one for transmitted light colors, (transparent and translucent glass), and one for reflected light colors (translucent and opaque glass). Samples of each glass color must be fired to reach their mature color. The fused glass artist must also keep in mind glass thickness. Thickness affects transmitted light, modifying the value of transparent and translucent glass. Thickness can also affect saturation of color. A thick piece of red glass may look red, but when very thin, it may appear orange or pink. 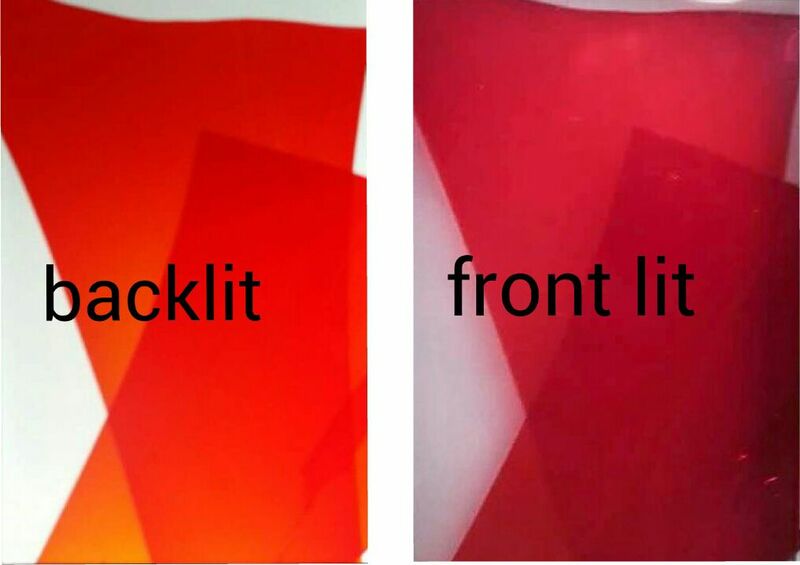 Thin transparent red glass may appear more orange when backlit. In the glass world, transparent glass refers to colored glass mixed with clear, also called Cathedral glass. Translucent or semi-opaque glass, usually referred to as opal, interferes somewhat with the ability of light to pass through it. Opaque glass does not allow light to pass through it all, only reflecting it. White opal translucent glass typically only appears white when reflecting light; most white opal glass takes on an amber tint when light passes through it. When compared to another piece of opal glass, for example, light blue, the white opal glass appears lighter, in both transmitted and reflected light, however if the thickness of the white opal glass is doubled, it will look the same in reflected light, but not as it transmits light. The white now appears darker than the light blue because it is thicker. In keeping with the Munsell system, there needs to be multiple samples of each color, so that the samples may be viewed stacked up. In this way, the user is able to visualize how that glass color will look when thicker and backlit. Many glass compositions have a variance in thickness–this variation gives glass character and helps to define an image. Other attributes of glass that can affect its color are the chemicals used to create the glass. A beautiful pure red is a difficult glass color to achieve, and as a result, the reds often seem a bit orange. This is because pure red glass typically has gold in it, driving the cost too high for consumers. 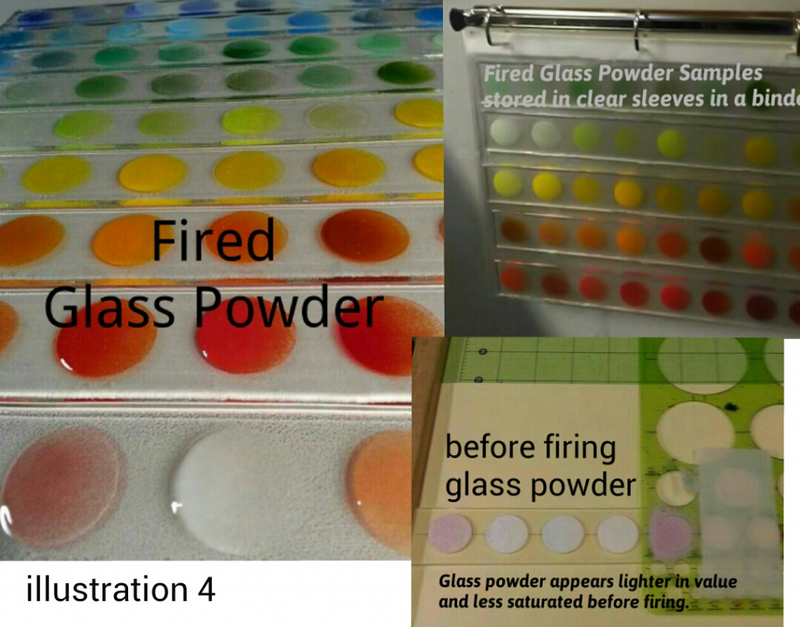 The chemical composition of glass when fired, can dramatically influence color. Copper which is contained in most turquoise glass colors, reacts with the sulfur in some warmer glass colors, such as red and orange. 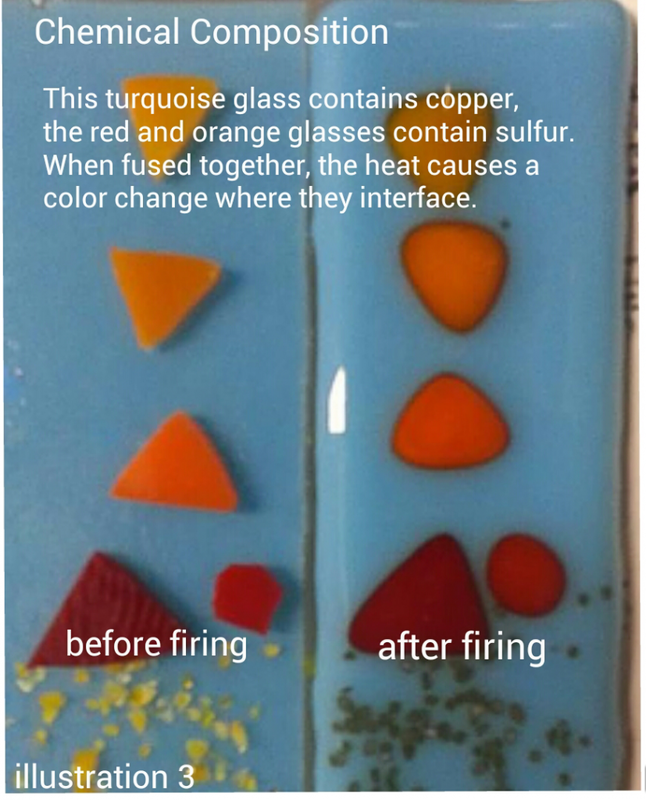 When heated to fusing temperatures, the reaction of the copper bearing glass with the sulfur bearing glass creates a third color at the interface. In addition, most glass created for fusing has not been heated sufficiently in the factory during production to show its mature color, so the artist must rely on glass samples that have been fired. 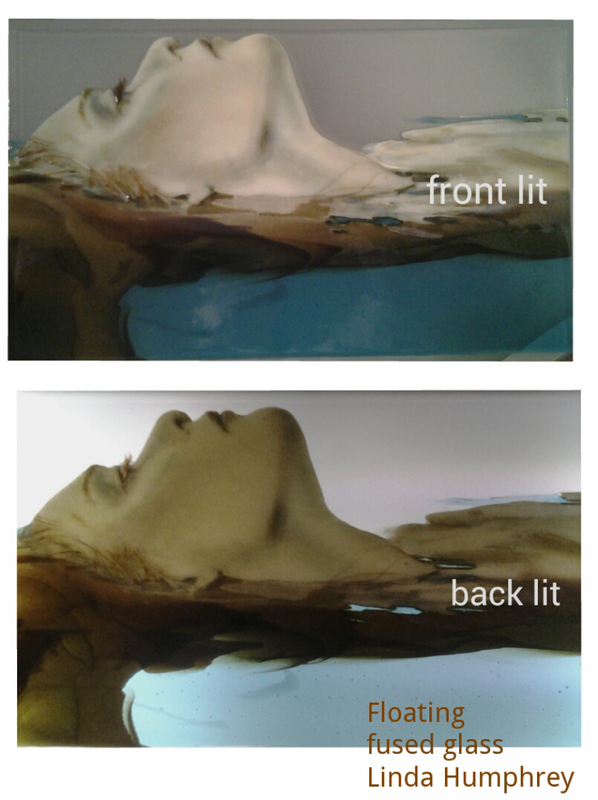 My fused glass work typically represents images of people. 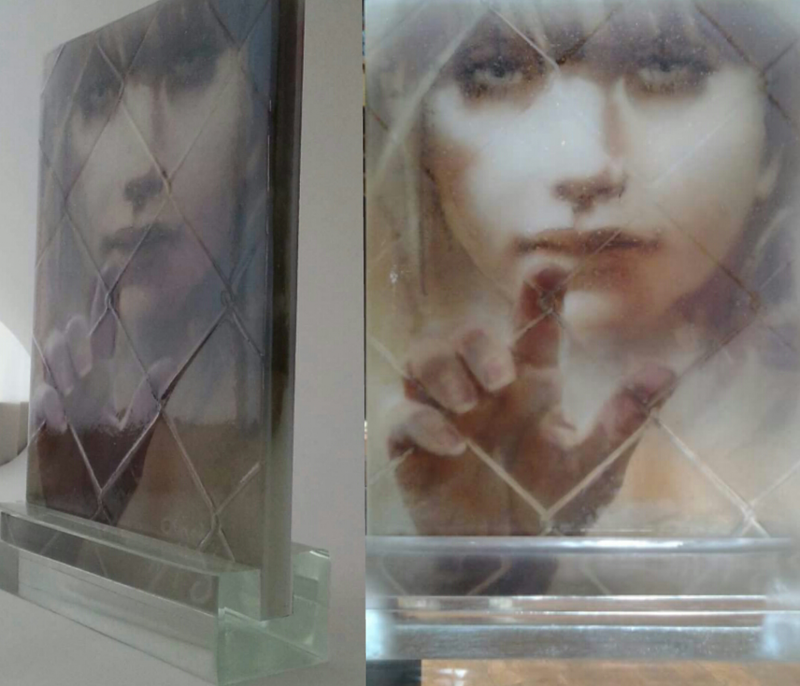 I draw these images using glass that has been broken into small particles, called frit. Frit is usually characterized by particle size and is available in coarse, medium, fine, and powder. The majority of my fused glass drawings is done with powdered glass frit. I sift the powder either directly onto a kiln shelf or onto a sheet of compatible glass. The glass is then fired in a kiln until fused together. I then repeat the process, adding more glass frit of varying colors and sizes to create my drawings. Each firing results fuses the glass together. 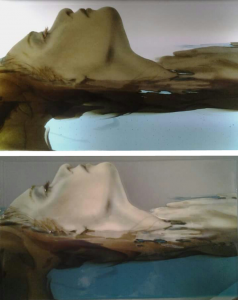 Following are photos of some recent images I have drawn in glass, shown in both transmitted and reflected light. 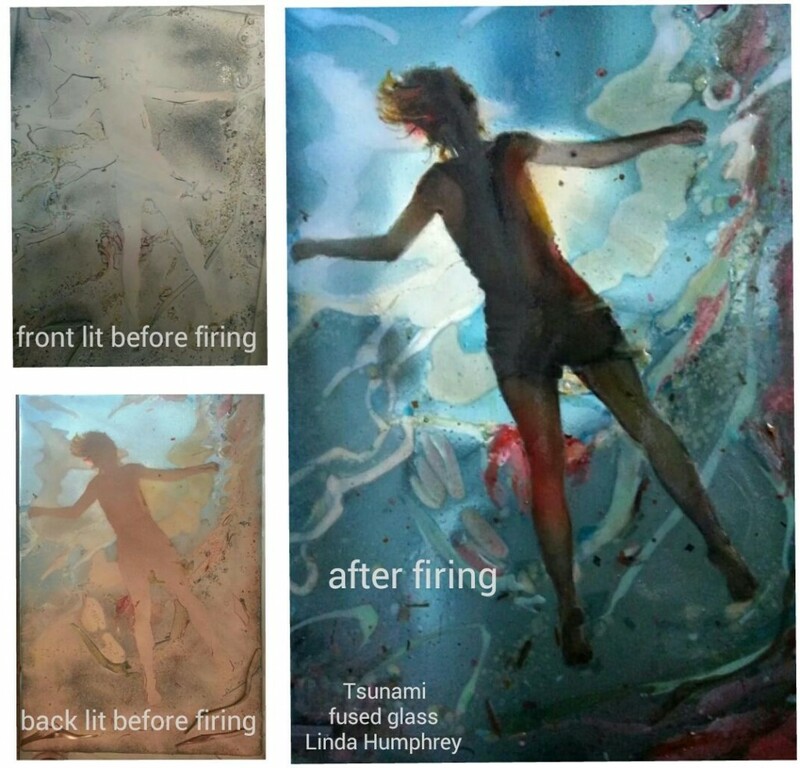 Linda Humphrey is a creative artist, emphasizing the human figure in glass, using techniques that she developed, for fusing mostly powdered glass. Color theory, visual perception and the light effects of glass, have been of great interest to her throughout her career. She has a BFA with an emphasis in figure drawing, 1981 Lindenwood College, St. Charles, Missouri, and an AFA in 1977 from Florissant Valley Community College, St. Louis, Missouri. Linda’s work is in multiple collections, including Bullseye Gallery. Photos of her work are currently in multiple glass catalogues. Thank you for posting my article. Munsell Color system, has been of interest to me, since I was in my teens. I’m 61 now, and still enjoy looking at your color solid and exploring color theory. I’m thrilled to be a part of your on line dialogue. Very beautiful pieces. You deserve more credit. Incorporating color into glass sounds like it could be tricky. There are so many factors that influence how it would turn out. I imagine that it takes a lot of practice to master glass fusing. 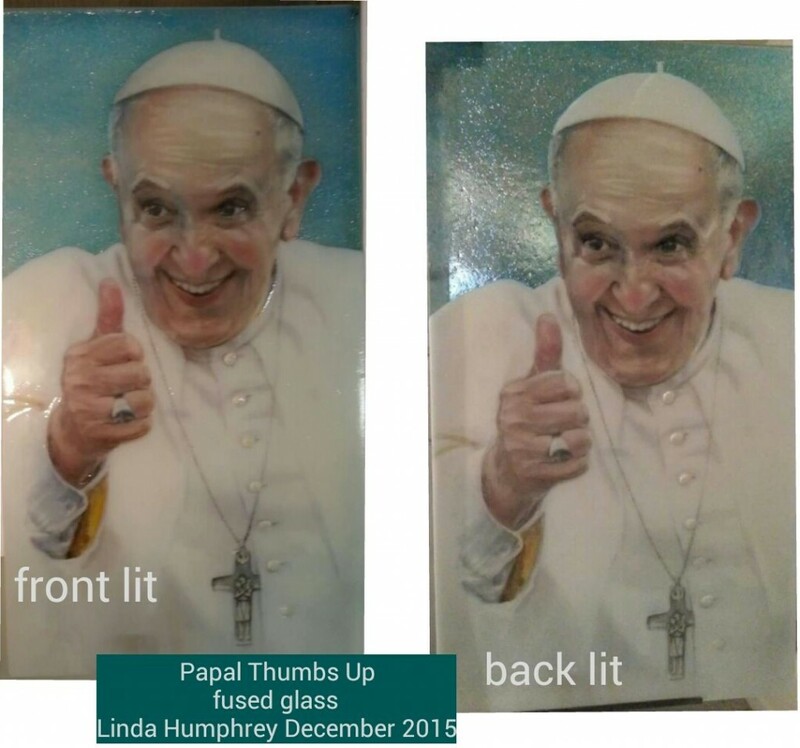 Thank you Linda Humphrey. Have been using Munsell in many media since 1971, after studying oil painting at an academy. At 65 I have decided the media I’ve been looking for most of my life is glass. So, this info is absolutely invaluable to me. Cannot thank you enough. And your work is phenomenal.